Describe what a roll-up summary field is. Create a roll-up summary field. Apply field-level security to your roll-up summary field. While formula fields calculate values using fields within a single record, roll-up summary fields calculate values from a set of related records, such as those in a related list. You can create roll-up summary fields that automatically display a value on a master record based on the values of records in a detail record. These detail records must be directly related to the master through a master-detail relationship. A custom account field that calculates the total of all related pending opportunities. A custom order field that sums the unit prices of products that contain a description you specify. Since roll-up summary fields are based on master-detail relationships, it’s useful to review object relationships before creating a roll-up summary field. Master-detail relationships closely link objects together so that the master record controls specific behaviors of the detail and subdetail record. There are a few different types of summaries you can use. COUNT Totals the number of related records. SUM Totals the values in the field you select in the Field to Aggregate option. Only number, currency, and percent fields are available. MIN Displays the lowest value of the field you select in the Field to Aggregate option for all directly related records. Only number, currency, percent, date, and date/time fields are available. MAX Displays the highest value of the field you select in the Field to Aggregate option for all directly related records. Only number, currency, percent, date, and date/time fields are available. From Setup, open Object Manager and click Account. On the left sidebar, click Fields & Relationships. Choose the Roll-Up Summary field type, and click Next. 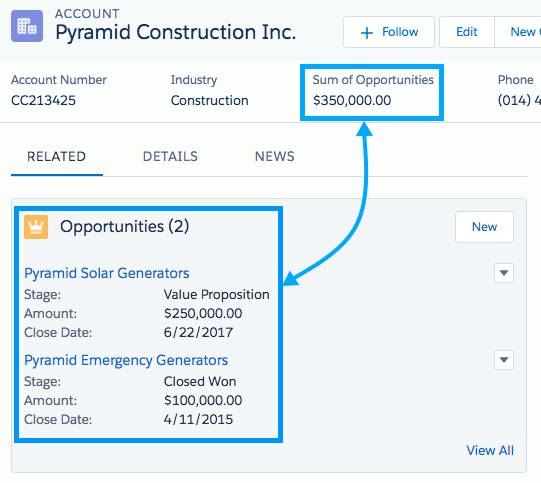 For Field Label, enter Sum of Opportunities and click Next. The Summarized Object is the detail object that you want to summarize. Choose Opportunities. Choose the SUM summary type and choose Amount as the Field to Aggregate. Click Next, Next, and Save. Here are more examples of detail data rolling-up to master records. A roll-up field was created on the Accounts object. 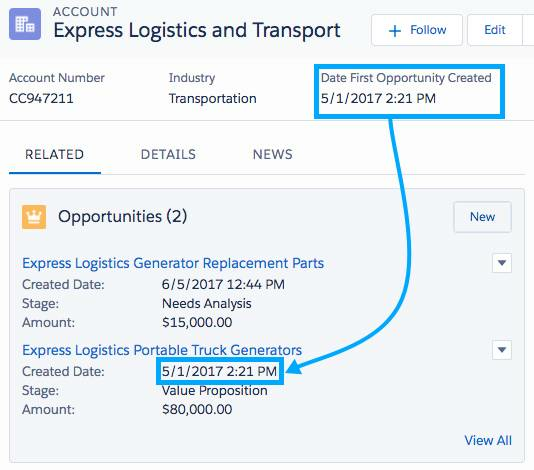 Created Date is summarized on the Opportunities object to find the earliest date an opportunity was created related to an account. A roll-up field was created on the Opportunities object. 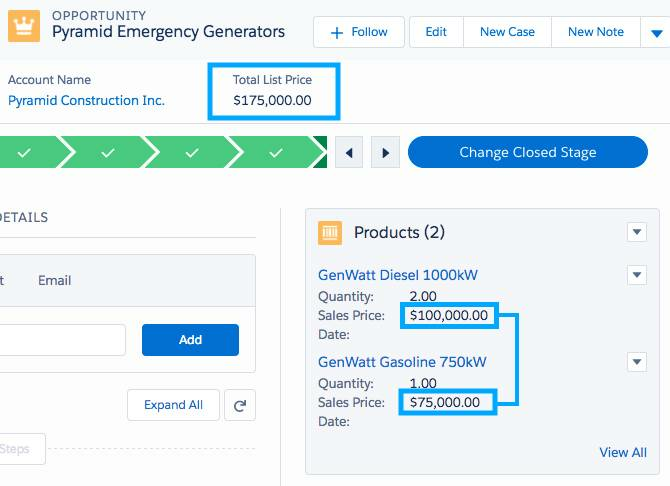 Total Price is summarized on the Opportunity Product object to find the grand total of all products related to an opportunity. A roll-up field was created on the Opportunities object. 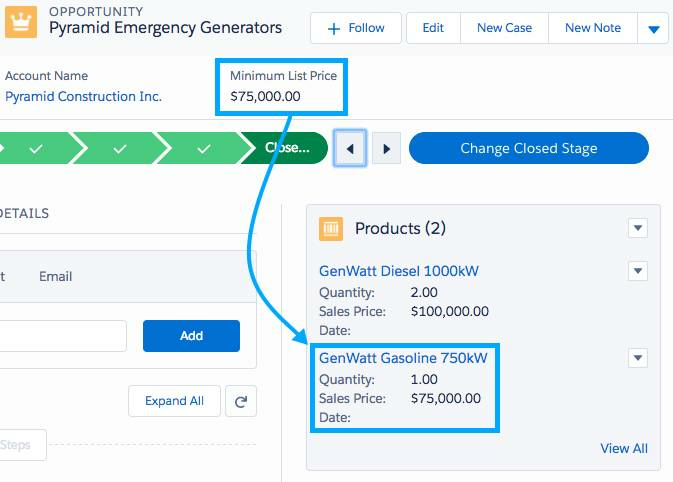 List Price is summarized on the Opportunity Product object to find the product with the lowest price related to an opportunity. Number, currency, and percent fields are available when you select SUM as the roll-up type. Number, currency, percent, date, and date/time fields are available when you select MIN or MAX as the roll-up type. Learn more about roll-up summary fields at https://help.salesforce.com. Remember, this module is meant for Lightning Experience. When you launch your hands-on org, switch to Lightning Experience to complete this challenge.